Over the past decade, natural gas has become a very important energy source. And that won’t be changing anytime soon. In fact, natural gas accounts for 29% of the United States’ total energy consumption — it’s the second most heavily consumed energy source in the U.S. right now. We’re using it at a rate of 77.7 billion cubic feet (Bcf) every day. Natural gas is so versatile, with uses ranging from residential and industrial to electricity generation. It also happens to be one of the cleanest-burning fossil fuels. Power plants are the fastest-growing users of natural gas. These power plants operate year-round and are more environmentally friendly than coal power plants. According to the Energy Information Administration (EIA), in 2015, coal plants contributed 1,364 million metric tons of carbon dioxide emissions to the total 1,925 million metric tons. Natural gas contributed only 530 million metric tons. Natural gas is the best fuel option for our environment... and for our future. In 2015, coal production fell to 33% from 39% the year before — a 6% decrease in just one year. That may not seem like a lot, but a continuation of that rate of decline would be very bad news for coal producers. Along with the decrease in coal production, coal-fired power plants are seeing a decrease as well. The Environmental Protection Agency (EPA) has begun implementing new emission standards to limit mercury, acid gases, and toxic metals. It’s too much effort for old coal plants to adhere to the new emission standards — as a result, coal power plants that have been around for years are beginning to shut down. 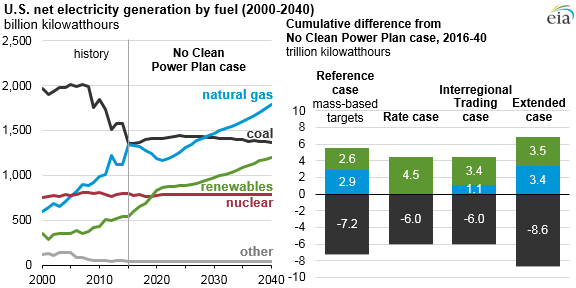 The EIA is predicting 90% of the coal power plants that were expected to close by 2020 will begin shutting down in 2016. Natural gas has been taking coal’s place as the energy big shot. It’s better for the environment and will have no problem abiding by the new EPA emissions standards... again, something coal won’t be able to do. Natural gas comes from deposits in rocks, which can be found on land, offshore, or under the ocean floor. Geologists use seismic surveys to determine the best location to drill wells. Once one or more production wells are in place, natural gas starts to flow up through the wells. Then it’s sent through pipelines to underground storage, where it will eventually be distributed to companies. Most of the U.S. experienced higher than normal temperatures in June, July, and August of 2016, resulting in a high use of air conditioning. This means power producers were burning more gas to meet customer demands. Weather conditions are a short-term driving force for natural gas prices. In the winter, people use gas to heat their houses, and in the summer, natural gas generates power for their air conditioners. Gas prices will increase because of the high demand for energy that’s needed to heat and cool homes. A long-term driving force for gas prices is inventory dynamics. Right now, natural gas supplies are above the five-year average and five-year minimum-maximum range, which has been putting a halt on the number of producers drilling for natural gas. It’s important to keep a lower-than-normal inventory because when supplies are low, that means demand is outpacing production, and that will lead to higher prices. The EIA is forecasting production increases by 3.7 Bcf/d in 2017 and 77.1 Bcf/d for average consumption in 2017. The time to buy natural gas is right now. It’s about to have one of its strongest years yet. Demand for natural gas is soaring, and supply is exactly where it needs to be to keep prices high. And other fossil fuels like coal can’t keep up. You don’t want to miss out on this opportunity. Before we part, we'd like to extend a sincere thank-you for joining us here at Wealth Daily. We look forward to providing you with valuable investment research and commentary over the course of your subscription. Our core philosophy is that the more you know, the better you'll be able to take advantage of that knowledge and expand your wealth. We'll continue to share our insights on how you can boost your portfolio with flexible and safe investments that will help you break free of the traditional trading traps and pitfalls financial institutions use to siphon off your wealth.